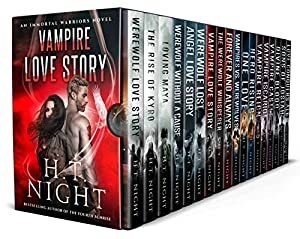 The epic saga of vampires and werewolves, heroes and warriors! This massive, generous, overstuffed collection features FOUR complete series! Out for a late-night jog, mixed martial artist, Josiah Reign, crosses paths with a group of men accosting a young woman. In a few short minutes, he takes care of her attackers... all five of them. But little does Josiah know that this one act of goodwill will introduce him to a strange new world of dreams... and nightmares. And so begins an unforgettable saga of two men and the women they love, two warriors and the families they raise, two fearless friends who will sacrifice everything to protect the innocent and, ultimately, take on the greatest of evils together. This is their incredible tale. Track It. This book has been £0.00 within the past year. We started tracking this book on April 24, 2012. This book was £1.98 when we started tracking it. The price of this book has changed 63 times in the past 2,550 days. The current price of this book is £5.84 last checked 54 minutes ago. This lowest price this book has been offered at in the past 90 days is £2.29. The lowest price to date was FREE last reached on June 1, 2018. The highest price to date was £31.37 last reached on August 20, 2018. This book has been £31.37 one time since we started tracking it. We last verified the price of this book about 54 minutes ago. At that time, the price was £5.84. This price is subject to change. The price displayed on the Amazon.co.uk website at the time of purchase is the price you will pay for this book. Please confirm the price before making any purchases.